Tickets can be purchased at the Revelstoke Rec Centre, Universal Footwear and Rough Country Marine. Salads, potatoes, variety of vegetables and dessert. The purpose of this event is to raise monies to support various conservation and community projects that the club sponsors, as well as fund the construction of the new gun range and operating costs of the Club. Each year many businesses and community members donate their time, in addition to items that can be raffled or auctioned off at the banquet. We greatly appreciate the amazing support we have received in past years. It has gone to such projects as the Bridge & Moses Creeks Kokanee spawning enhancement program, the Williamson Lake Annual Family Fishing Day, installing fish tanks in schools along with updated books and literature for biology libraries in schools. 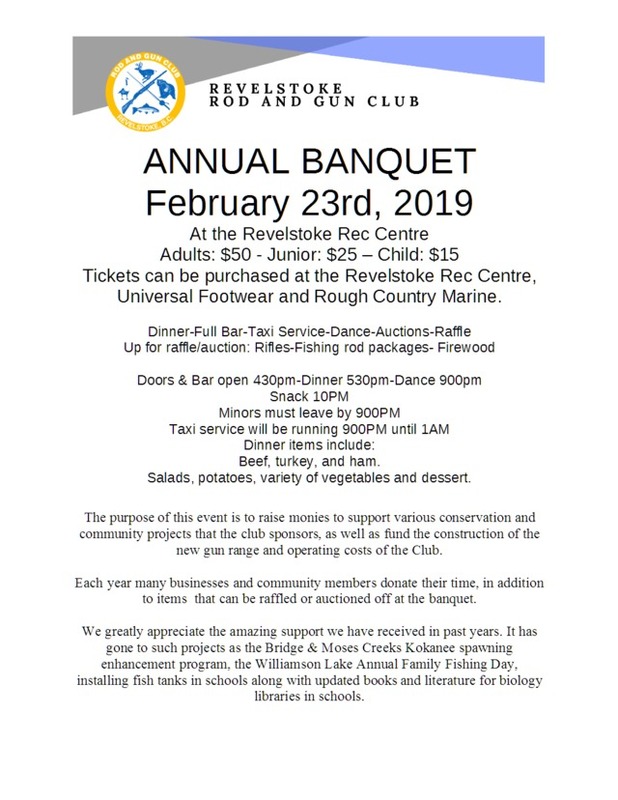 We need everyone to come make this years Banquet a success, and support the Revelstoke Rod and Gun Club at this great fundraiser!